Tuesday's Irish Times has a report by Professor Michael Burawoy of the University of California, Berkeley on Learning from the global phenomenon of "universities in crises". He makes lots of points and "suggests strategies for the survival of our universities in the face of massive financial problems" in the region of a "€500 million-plus deficit". He suggests three strategies to tackle this problem. Prof Burawoy's talk on this subject to the Royal Irish Academy on 13th January last can be heard here. 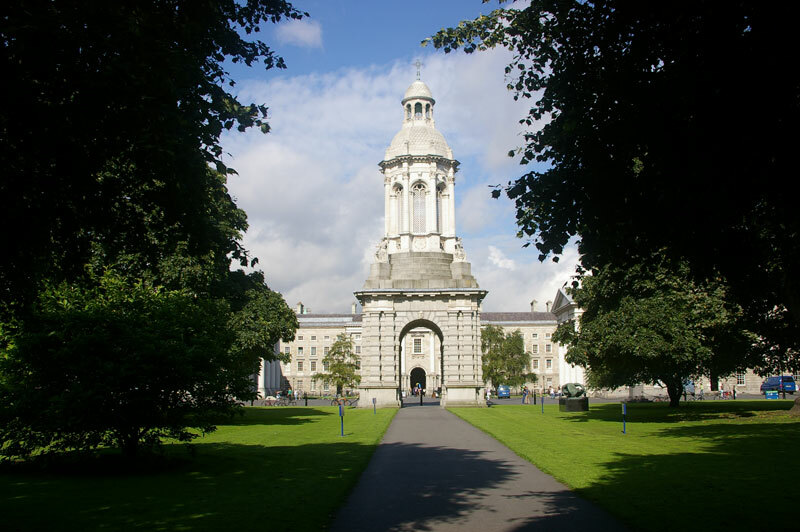 My University Alma Mater - Trinity College. The first strategy is to "turn to the private sector, for long a favourite move in the US, and now spreading across the world". Nothing new for us there. I'm not sure how well this would currently work as a strategy here. I understand corporate donations are very difficult to source in Ireland's current economic climate. The second strategy is to "increase revenues by introducing and/or raising student fees, whether through a deferred loan system or pay as you go". Nothing new there either. This is a hot potato in our General Election campaign - any party advocating the re-introduction of fees will get a hostile reception. Fine Gael should be careful with this strategy. I predict Labour in government will prevent the re-introduction of fees (though may allow back door fees, like the registration charge, to increase). The third strategy is to "reduce costs" by replacing "permanent faculty with part-time workers, or use short-term contracts" and by making more use of tactics such as more "distance learning or shortening degrees are other ways of diluting education to make it cheaper". I hate that expression - "diluting education". Here there are some newer options. At NCI we make extensive use of a lot of part-time Associate Faculty - in addition to being cheaper for the College, we also benefit from some great industry experience and some wonderful hard-working lecturers. In fact many Associate Faculty teach more hours per week than I or many of my full-time colleagues do. I myself started out in NCI in the Associate Faculty. I'm certain it costs less to educate a student at NCI than in some other Colleges. Distance learning, blended learning, or e-Learning will certainly reduce the costs of delivering courses, but many third-level Colleges do not have the expertise or the resources to do this effectively. Universities and Colleges must make the decision to move to distance and on-line learning an educational one, not a financial one. Whatever "strategies are pursued, they all have grave consequences for the structure of higher education" according to Buroway. He concludes that in Ireland "where the university is still a tiger, it must not succumb to the whims of the market". Any decision should be a public one, and not be "anonymous decisions made in the corridors of power or by the logic of the market". Can Social Networking Keep Students In School?